Disclaimer: All species and details have not yet been verified. Contact me if you intend to quote any. 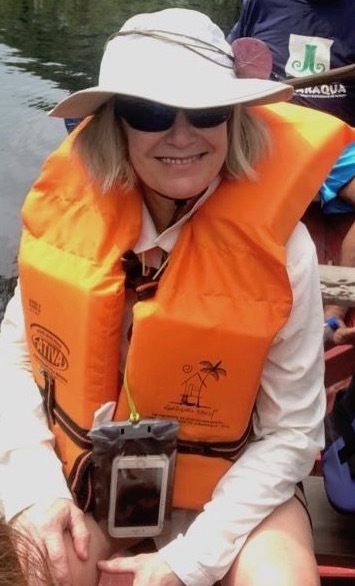 I was fortunate to be invited on a boat trip to Amazonia. I knew I would write a blog of some kind, but what would be the message? There could be so many. 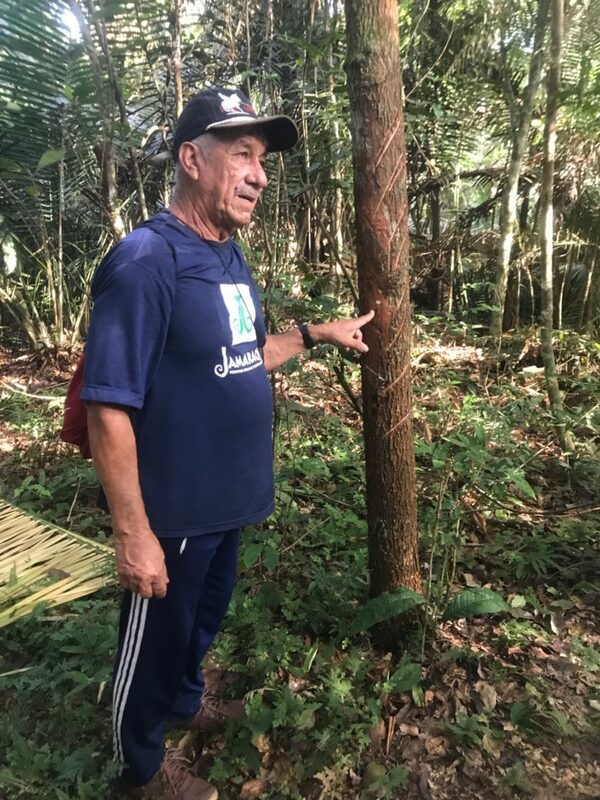 I settled on one of hope; hope for a long life for the rich and diverse Amazonian environment – the lungs of our planet; and hope that more might acknowledge and value the communities who live there. 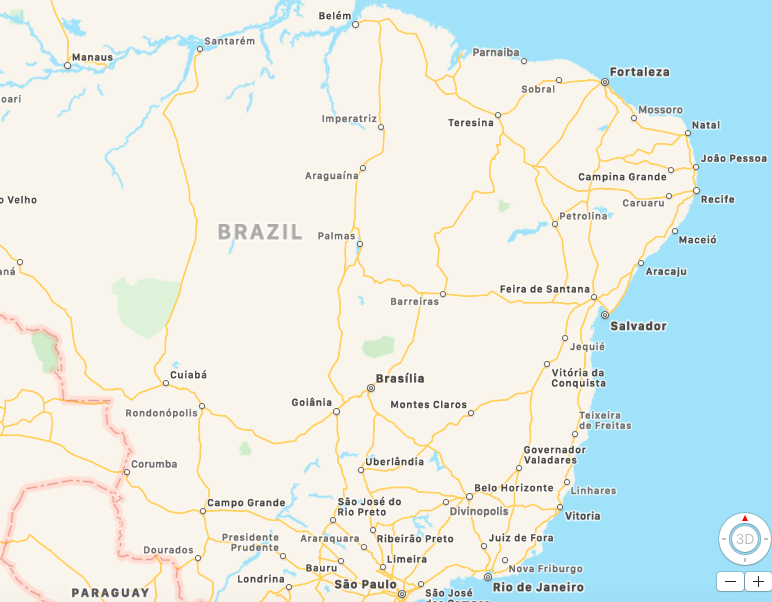 The trip began at Alter do Chao, west of Santarem, then up the Rio Tapajos and back, up the Rio Arapiuns and back to Santarem. 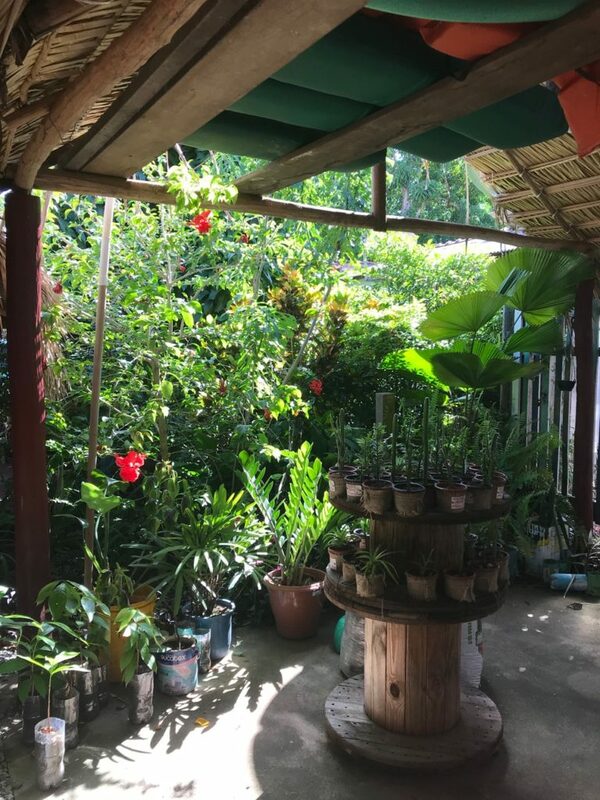 Beginning in Alto do Chao – the pousada (hostel) already promised beautiful plants. 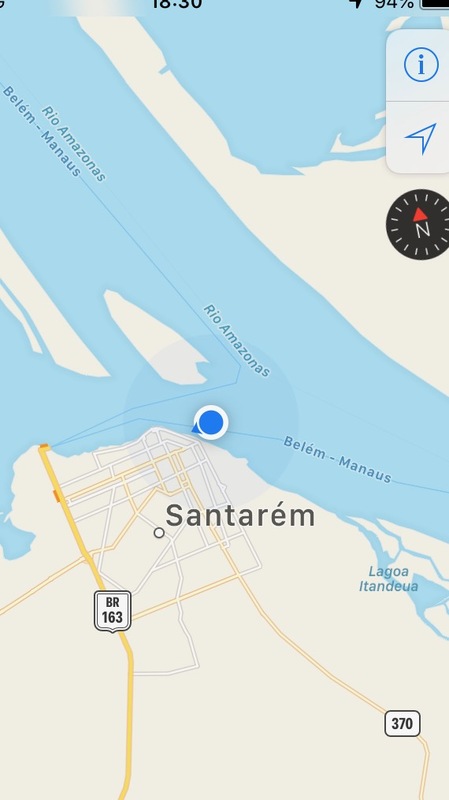 Then on to our boat, which accommodated 16, and round the coast to Belterra beach; white sand, clear warm water of the Tapajos river and apparently few mosquitos. The following day we visited the Jamiraqua community (comprising 126 people). There are 21 such communities in the Flona National Forest. 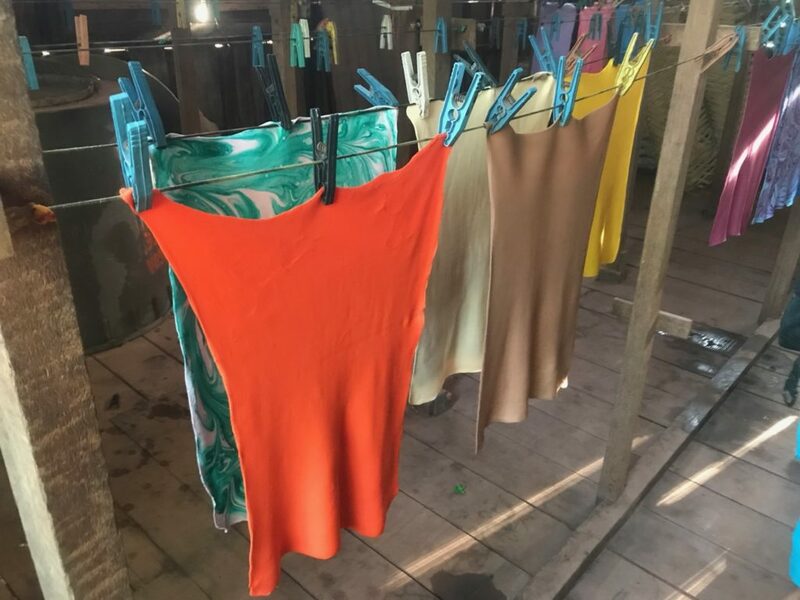 We saw how latex was collected from the rubber tree Hevea brasiliensis and processed, dyed and fashioned into jewellery and other handicrafts – of course, I bought some. 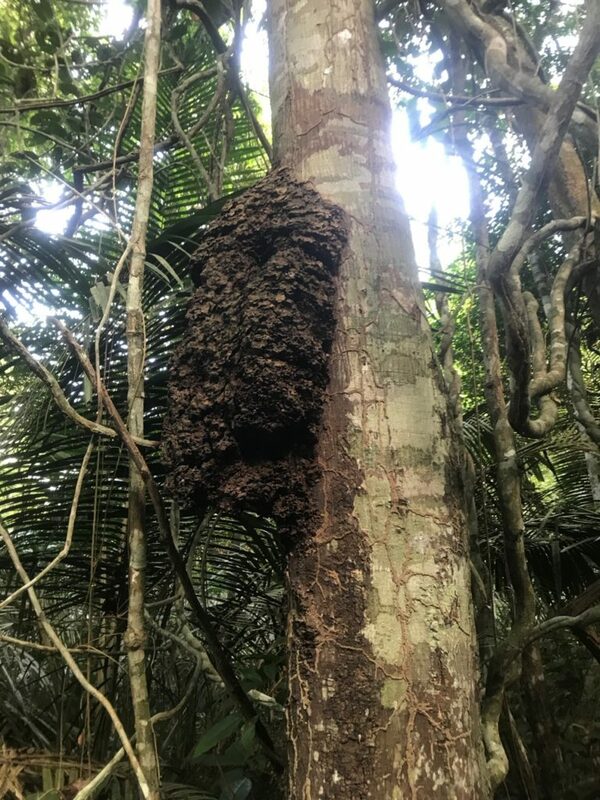 The guided walk through secondary and primary forest provided interesting species and extracts at virtually every step, from the Turtle stair vine, producing a resin purported to relieve intestinal complaints, to the giant termite nests hanging from trees and purported to produce an anti-inflammatory. 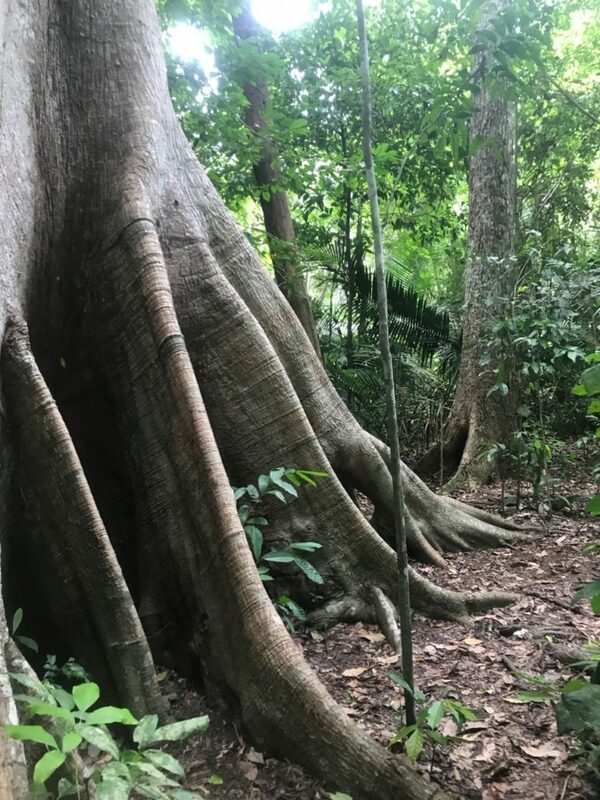 But the real highlight for me was meeting the giant 500 year old Sumauma tree (Ceiba pentandra) and standing humbly at its elephantine feet. 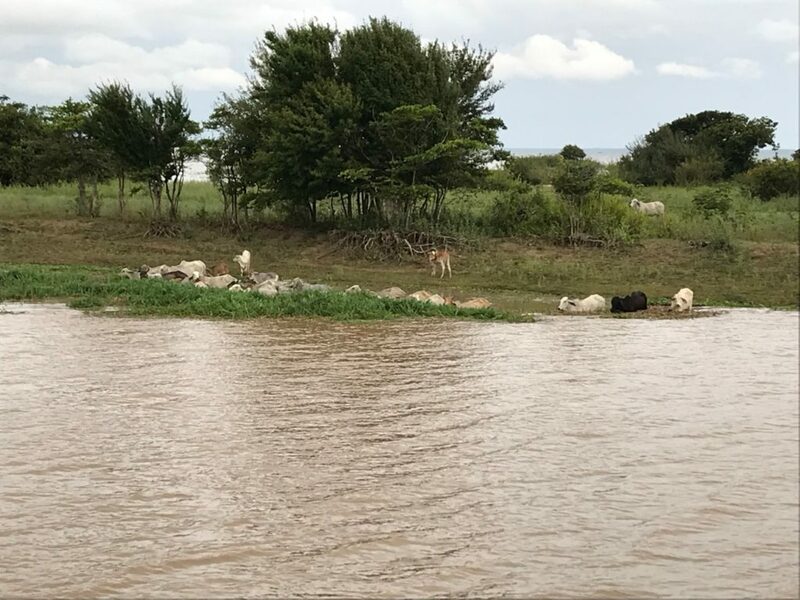 The tour of this community concluded with a canoe trip with time to reflect on how the environment copes with seasonal flooding, as the rainy season was about to begin. 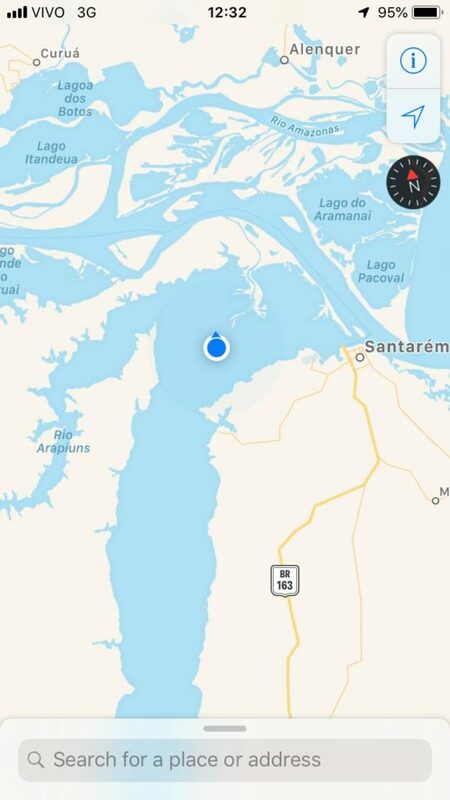 We travelled through the night to arrive at dawn entering the channel to Arapixuna; the channel would eventually meet the Rio Amazonas but we would turn back halfway to continue on the Rio Tapajos. Here the treat was birds and pink dolphins, the dolphins we saw being truly pink on their rumps and stunning. 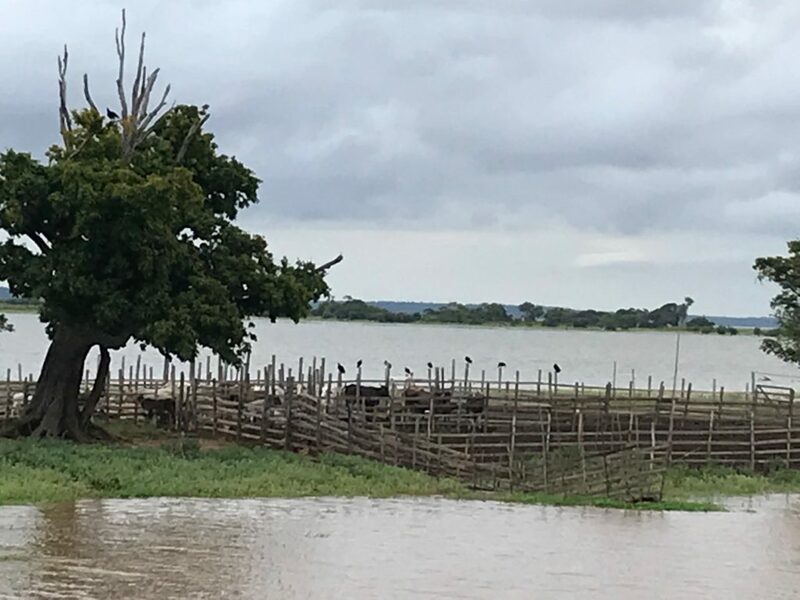 The summer farms on exposed land spits provided home for cattle, these being able to graze in water, and every post was a perch for birds; my research of what species I actually saw is ongoing. 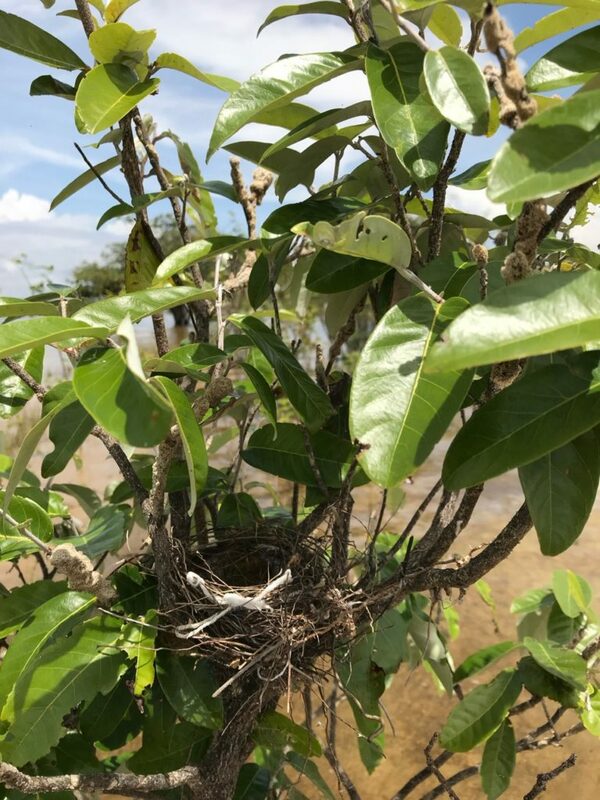 Our next mooring point was another hot sandy beach full of cashew trees and perfect homes for individual bird nests. Day 4 offered another absolute treat. Travelling up the Rio Arapiuns and definitely out of fleeting 3G signal, we visited the Atodi community, comprising 48 families and 170 people. 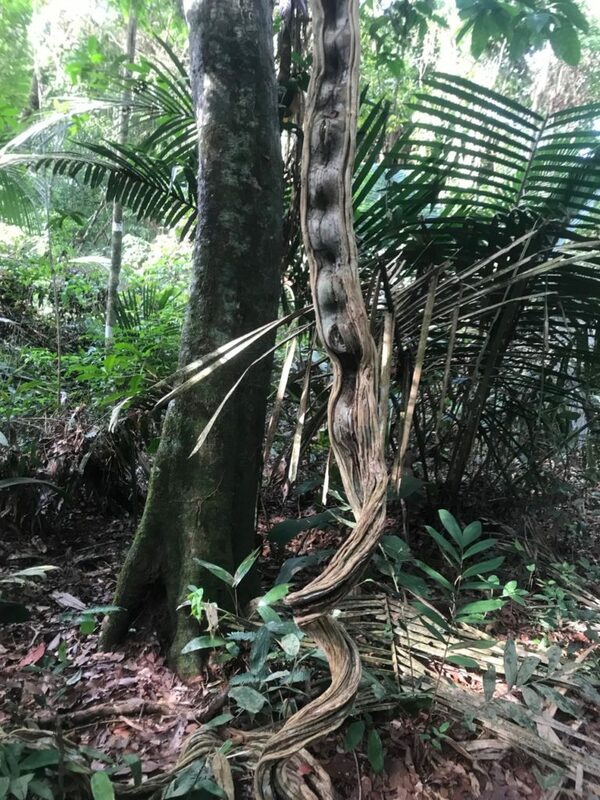 Due to heavy rain it was impractical to visit the primary forest where we would have seen Brazil nut trees (Bertholletia excelsa) but there was plenty on offer in the secondary forest including seeing how to use palm leaves to create shelter and basketry and seeing how Cacao grows (Theobroma cacao) and its seeds that give us chocolate. 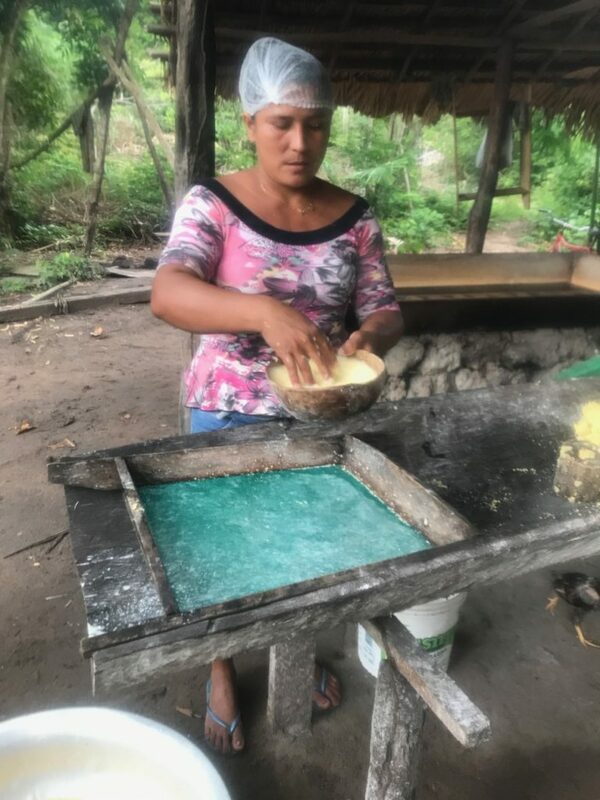 Later that day we saw how the community prepared manioc and tapioca, also known as cassava, from the Manihot esculenta tuber. This was more than food processing, it was a cultural experience and clearly a core part of the community’s existence. Virtually every part of the tuber is used and practice to degrade the poisonous cyanide component in the raw root is clearly understood. The manioc and tapioca are taken to market to sell as well as being consumed at every meal. More was to come, we were proudly shown the community’s library and plans to build a new one. Four confident young people aged 9-11 each stood up and introduced themselves to our group and read their storybook. It was impressive. These communities have less than 3 hours electricity every day. 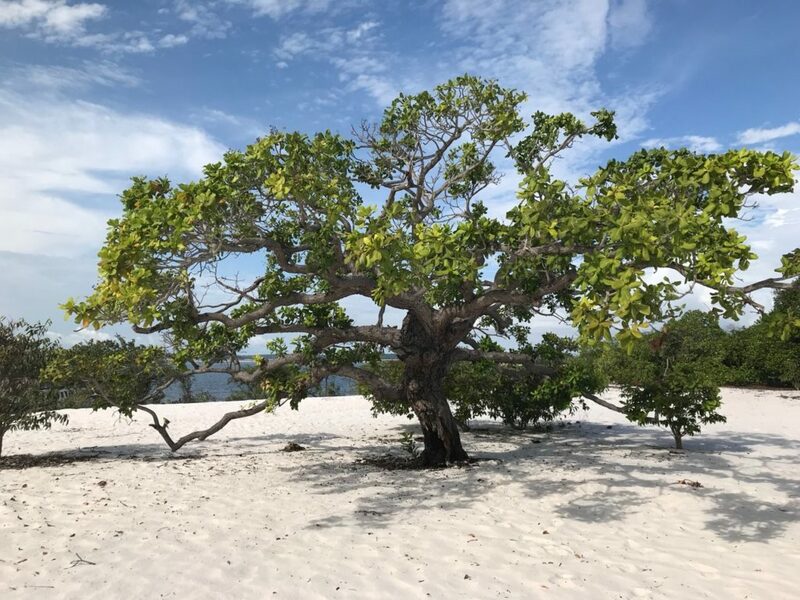 I came away with a real sense of admiration for them, not for how they managed without facilities that I take for granted, though this is remarkable, but for their abilities to live with apparent contentment and happiness with the resources available to them. Their respect for education and guiding their children to learn happily was clear to see. The boat trip ended with one more amazement. 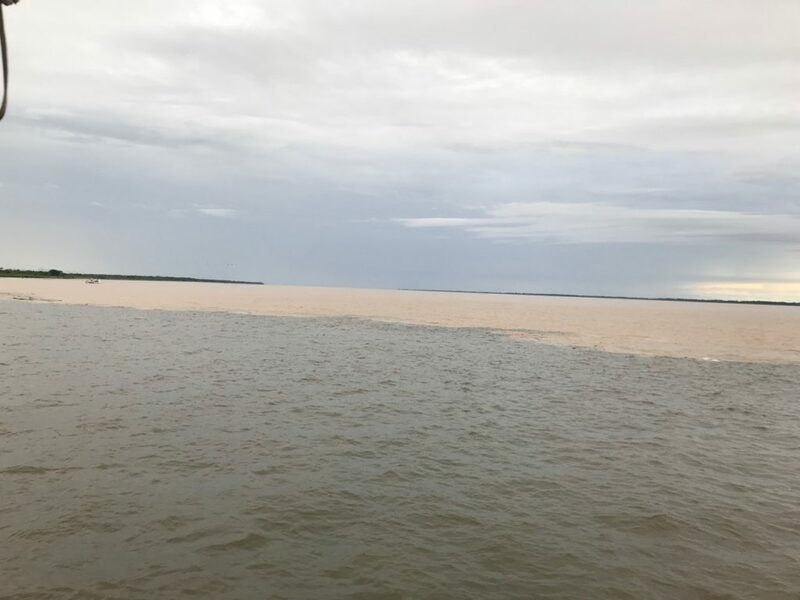 At the meeting of the Tapajos and Amazon rivers, there is a line between the two waters – clear, acidic water of the Rio Tapajos and muddier water of the Rio Amazonas, full of floating timber and other organic debris. It was as if there were a fence below the water – amazing. The tour was run by Tourismo Consciente (www.turismoconsciente.com.br). Did I need to preface this piece with hope? I’m afraid so. The Amazonian environment is under threat from deforestation policies and climate change and yet it is vital to weather systems and food security around the globe (http://www.fao.org/in-action/at-home-in-the-amazon/en/). The environment I saw will almost certainly be poorer within 50 years without attention to preserve it. My hope for the communities presented me with a new thought though. 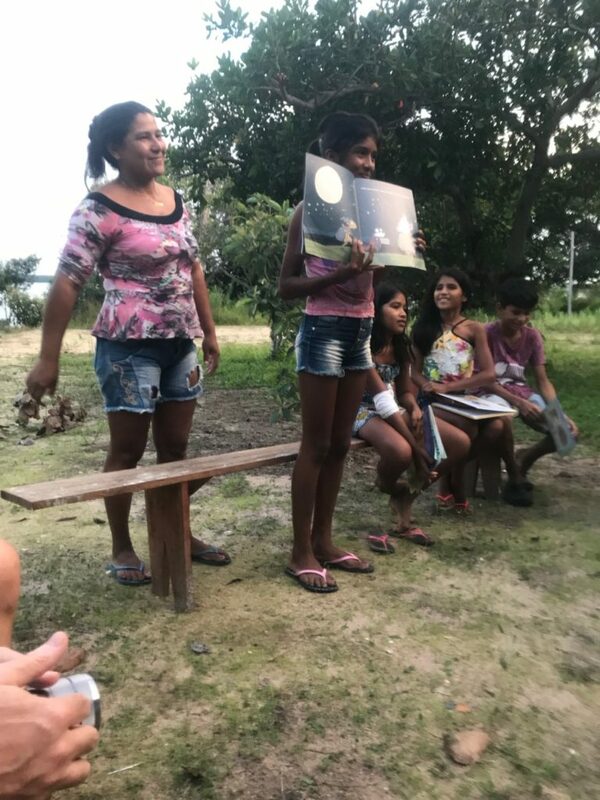 As I reflect on how prevalent mental health concerns are in the developed world, where many have an abundance of material wealth yet search for purpose and happiness, the human spirit of the Amazonian communities was an inspiration. I doubt the communities know this is an asset, but I think it is, so yes, I very much hope they continue to thrive. 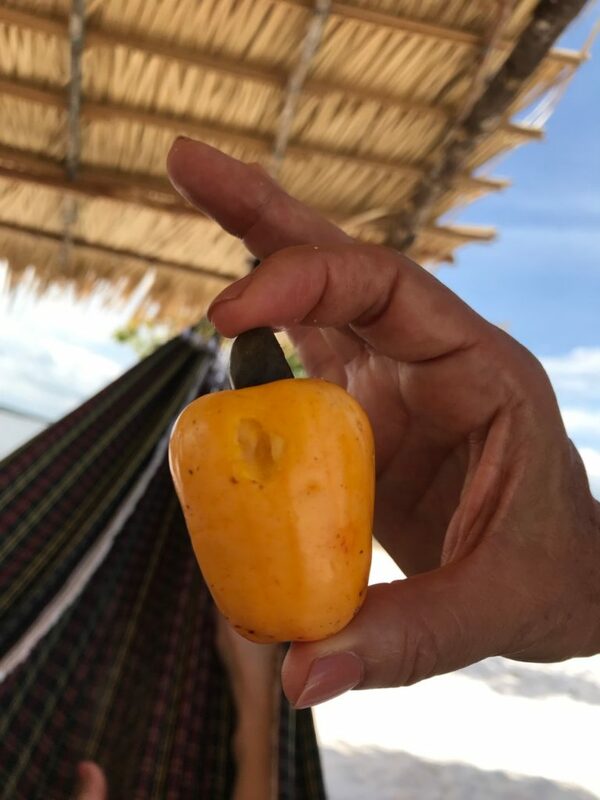 Many thanks for your informative commentary on the exciting & picturesque Amazon trip. Sounds like you had a lovely time. Please post more pictures! What an amazing experience . What an amazing trip. I enjoyed your blog!